Pasta Sauce recipe made with LOVE. 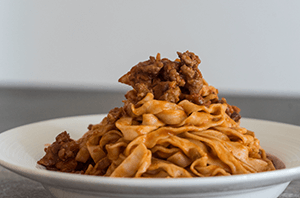 In this recipe I am re-creating a new version of Bolognese sauce and I use some special ingredients to make my pasta sauce more delicious. 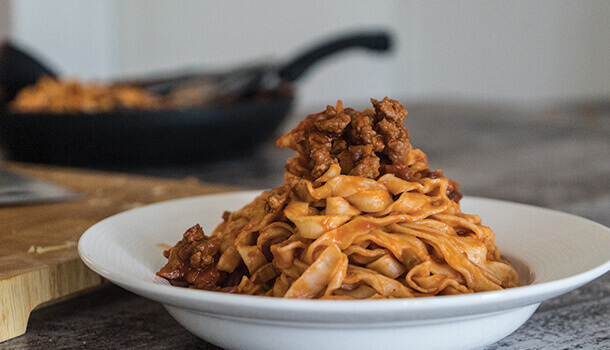 This is not the authentic bolognese sauce recipe but it’s a reinvented version. This Italian Pasta Sauce recipe will literally make your lick your plate. To make the fresh pasta, pour the flour on to your board/table. Make a small-medium size mound using the flour and create a well in the centre. Crack each egg onto the plate, then drop it into the well. This will prevent any unwanted egg shell remnants from getting inside the flour. Whisk the eggs carefully using a fork. Bring the edges of the flour into the centre with the fork, and quickly continue to cover them all the way around. Keep doing this (making sure the egg doesn’t run away!) until all of the eggs have folded into the flour. You will need to use your hands at this point. Begin to mix it together using both hands until the dough for the fresh pasta begins to form. Keep kneading the dough so that it begins to firm up and also smooth out. Cut a couple of slices from the main piece – approx. 2-2.5cm thick, and feed them through the largest slot in your fresh pasta making machine. Each time it passes through, fold it together and repeat. Work your way down to the thinner options until you get the smooth consistency required. You might need to sprinkle some added flour on top of the sheet, to prevent it from sticking. It is then time to pass the pasta sheets through the correct option for Tagliatelle. Finely chop the carrot, celery and onion. Put the saucepan on the stove at a medium heat and add some extra virgin olive oil. Add the carrot, celery and onion. Cook this for 5 minutes until it becomes nice and golden. Add in the sausages and prosciutto and stir well. Break the sausages down using a wooden spoon and blend it in well with the other ingredients. Add salt, pepper and mix it through as well. When 80% of the sausages has turned brown, add 100ml the red wine and cook it until it evaporates. Add the Italian Tomato sauce into the mix and stir it well. After around 5 minutes add the stock. Cover the saucepan with a lid and cook the pasta sauce recipe for 1 hour. Add 5L of water to a large pot and bring it to the boil. Throw in a few pinches of rock salt, mix it through and add the Tagliatelle Pasta. Cook the pasta for your Tagliatelle Bolognese dish until it is al dente, and then strain it well and add it to the saucepan of sauce! Add basil to the sauce Mix it together well. Sprinkle a generous amount of parmesan cheese on top along with a few leftover basil or celery leaves.